The hot topic today is diving ('simulation') in football. Following Dutch star Arjen Robben's confession that he "took a dive" (ie. fell over on purpose) during the Netherlands' Last 16 game against Mexico yesterday, discussions have raged about whether players should be punished retrospectively for these actions with a suspension from playing the next match. I don't condone diving (not that it would matter if I did); it is, quite simply, a form of cheating - of gaining an unfair advantage - and should be punished with a straight Red Card. However, some of the comments about Robben - both from the general public and professional pundits - strike me as ludicrous. A bad tackle is a bad tackle - the reaction of the player on the receiving end shouldn't come into that. If a defender goes sliding in with a dangerous, reckless challenge, what does it matter whether the player with the ball tries hard to stay on his feet or collapses in a instant like he's just been stabbed in the back of the leg? The defender's play was still dangerous, and still deserves to be punished - by the awarding a free-kick or a penalty. Even more importantly, a players 'reputation' shouldn't come into things either. Each appeal for a penalty or a free-kick should be judged on its own merit, not through the prism of 'past form'. Whether Arjen Robben did or didn't dive (or 'exaggerate') when the Dutch were awarded the penalty which won them the game, there was more than one occasion earlier in the game when Robben quite clearly should have been given a penalty and wasn't, because of his reputation as a diver - that is just as great a miscarriage of justice as a penalty being spuriously awarded following a dive. Further plans are afoot to 'make Formula 1 more exciting' - which is, of course, ridiculous. The latest proposals to introduce standing starts after Safety Car periods, and to fit titanium 'skid blocks' (designed to create more sparks when they make contact with the track surface) to the floors of the cars are just the latest in the long-running 'Hollywood-isation' of the F1 which sees it constantly moving further and further away from a true sporting contest, and more and more towards a scripted, artificial farce. I have written before about how nonsensical it is to try and manufacture 'excitement', and about how we are in danger of allowing this to detract from what Formula 1 should really be all about (ie. driver skill and engineering prowess). The real excitement in sport comes from its unpredictability - not knowing how the event will pan out when competitors are pushing themselves and each other to the absolute limits. Yes, creating extra sparks and extra crashes and extra controversy will be 'more dramatic' - but it will also be totally artificial, and not a true reflection of events on track. 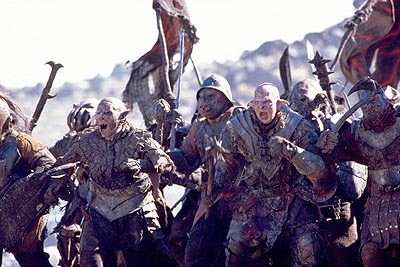 At this rate, the FIA may as well also hire in a special effects team to create CGI gunfire and explosions and a pit-lane invasion of orcs from Lord Of The Rings. That would be exciting, wouldn't it?! "This ought to liven up the final round of pitstops!" Personally, I would much rather watch a so-called 'boring' race which is real, than one which has been 'created for my entertainment' like some sort of motorsport version of Made In Chelsea. I sincerely hope that these latest ideas end up on the same scrapheap as the terrible 'artificial rain' sprinklers concept from a few years back - where, if there's any justice in the world, this season's awful 'double points in Abu Dhabi' debacle will also eventually find itself. It always makes me slightly uncomfortable to see people writing, Tweeting and whinging about the Glastonbury Festival. The current trend, as with everything, is to disparage and mock - and I guess that's fair enough, if that's your thing. But the sneering and snobbery can be pretty unedifying. Brendan O'Neill makes an interesting point in The Spectator about Glastonbury's move towards regulation, green policing and health-and-safety countermanding the festival's original principals of freedom and sticking two fingers up to 'the man' - but the issue I have is with those who eschew Glastonbury because it has become 'too middle-class', or 'too corporate'. Ignoring, for a minute, the obvious quandary of defining such 'problems' in the first place (how 'middle-class' is 'too middle-class'? And in today's complex society, what is or isn't 'middle-class' anyway? ), it baffles me how people can utter such things and not consider themselves snobbish and élitist. What people are really saying with statements like these is: "Gastonbury is not for you. We don't want these sorts of people coming 'round here!" What would be the reaction if, for example, affluent golf club members were seen to be complaining that their club had started letting in 'the wrong class of people', and that this was ruining the atmosphere of the place? Not good; but how is that any different, in principle, from some festival-goers' attitudes towards Glastonbury? Surely the founding ethos of a music festival like Glastonbury is that it is an inclusive and welcoming community, and that the usual conventions of an often divisive and cut-throat society do not apply? By denouncing Glastonbury as 'full of the wrong types of people', those expounding these views have become everything which they would normally profess to hate - élitist, classist, prejudicial snobs, looking down their noses at people for being different from them. I sadly wasn't able to watch every single group match (with the kickoff times being in the evenings, I've often found I'm working when the games begin), but I have seen as many as I possibly can, and tried to catch up on other matches later, either by recording them or watching online. The four sides which impressed me the most during the group stages were: Germany, Chile, France and the Netherlands. Germany have been tipped to go far in this competition already. They have a wealth of talent in all areas of the pitch, and some very technically gifted players; the one area in which they might be said to be lacking is in central attack, often lining up without a bona fide centre forward - but in veteran striker Miroslav Klose, they have a forward player already proven time and time again at the highest level available to bring on, should they need him. The Germans' dismantling of Portugal 4-0 in their opening group game was a statement of intent from them, and they definitely have the quality in their squad to back that up. Chile are maybe not the team that springs immediately to mind when one thinks of South American football, but they have been hugely impressive throughout their World Cup campaign so far. The Chileans play an intensely high-tempo style of football with passion and fervour - current world Champions Spain looked worn out and punch-drunk after barely half-an-hour in their recent game against Chile, playing with an air of wearied resignation instead of their usual incisive passing game. Tirelessly hardworking, Chile look utterly fearless both with and within the ball, refusing to be intimidated even by such illustrious opponents as Spain - but they have real quality, too. Barcelona forward Alexis Sánchez is always a threat in front of goal, whilst Eduardo Vargas' goal against Spain to put Chile 1-0 up has, for me, been one of the highlights of the entire tournament, so far. A Round Of 16 clash against hosts Brazil this afternoon will be a stern test, but I don't expect Chile to be daunted by this prospect at all. France are an unusual choice, perhaps. They may have had a relatively 'easy' group out of which to get, but they way they have set about that has left no one in any doubt that this is a squad who can really play. I think lots of people wondered how they would fare without star midfielders Franck Ribery of Bayern Munich (injured before the World Cup) and Manchester City's Samir Nasri (controversially left out by manager Didier Deschamps), but the French have really gelled as a team, and look very much at ease on the ball, working as a single unit to cut teams open as they push forward. In Karim Benzema and Olivier Giroud, France have strong attacking talent in their squad, and with players like Mathieu Valbueno and Yohan Cabaye in midfield, they won't be short of service either. I don't think France are anybody's favourite to win the tournament, but I wouldn't be surprised to see them reach the semi-finals, and their relatively young squad will undoubtedly be a force to reckon with in years to come. Having provided the first (and still, so far, the largest) upset of this World Cup in coming from behind to beat holders Spain 5-1, the Netherlands established themselves as the tournament's official "dark horses" pretty early on. Their fast, counter-attacking style of play has been hugely effective for them - but they've also shown themselves capable of hunting down a game when they go behind, and having the resilience to get themselves back into contention. In Arjen Robben, the Dutch have a very special player indeed - someone with pace and technique, but also with the intuition and awareness of the game to be able to create something out of nothing. Robben seems able to find space where there seemingly is none, and when the ball falls to him in the box, you feel something exciting is bound to happen. A Round Of 16 match against Mexico is no easy task, but I expect the Netherlands to rise to the challenge, as they have done each time so far. So, is the overall winner of this World Cup going to be one of these four teams, then? Well, they all have a chance, for sure… But, as is so often the way, things aren't quite that simple! Plenty of discussion in the run up to this tournament centred around the fact that European teams don't win World Cups held in South America - and yet, three of the four teams I have picked are European sides! Something doesn't add up here. Well, whilst they may not have stunned us to quite the same extent during the group matches, only a fool would write off South American giants Brazil and Argentina at this juncture. Brazil have world-famous footballing pedigree, and plenty of talent in their squad - including Barcelona forward Neymar, and Paris Saint-Germain defender Thiago Silva. Perhaps even more significantly, though, they are playing on their home turf, in the universally recognised home of football, in front of their own adoring fans. You can never discount Brazil, and even if they may not have the same strength of squad as, say, Germany, they are still an extremely good side - and spurred on by a passionate and exuberant home crowd, you can't say it would exactly be a surprise to see them still there or thereabouts as we move towards the business end of the tournament. Argentina are another South American team with a proud history - but also another who didn't exactly set the world alight during their group games. In their opening game against Bosnia and Herzegovina, had it not been for a very unfortunate Bosnian own-goal in the opening few minutes of the game, the first half would've been entirely dominated by the Bosnians, with Argentina on the ropes for large spells of the play. However, Argentina can always rely on the truly remarkable Lionel Messi to dig them out of a hole - as he has done already, on a couple of occasions. The rest of the Argentinian squad are hardly Sunday League players, but so far it has only Messi been who's really shone at this tournament; his mercurial touch may well be the difference for Argentina this time around - and like Brazil, it will hardly be surprising to see them progressing further and further through the World Cup. So, there we have it. Based on what I have seen so far, it is my belief that the winners of the 2014 World Cup will come from one of the six teams I have listed above. However, these are purely my own thoughts and feelings about the matches I have watched, and should not be taken as anything more; please don't remortgage your house in order to place the entire value as a bet on one of these teams, just because of what I have written! I can take no responsibility for any losses incurred as a consequence of such folly. So, England are out of the World Cup. Following Costa Rica's 1-0 over Italy this afternoon, England are no longer able to qualify from the group stages - not even mathematically. FA Chairman Greg Dyke's much-criticised "throat-cutting" gesture at the group draw last December now looks oddly prophetic. Is anyone surprised? I'm not. I'm disappointed, obviously - gutted, in fact. But not surprised. Once again, the nation's football supporters - whipped up by an ever-hysterical media - have been expecting far too much of a group of players who are, at best, fairly decent. The arrogance with which pundits and fans dismissed Costa Rica as "no-hopers" has come home to roost, as they top the group with two wins from two games, leaving Italy and Uruguay to battle it out over the other available place in the last sixteen. In a poll on Twitter, BBC Sport found that 61% of England fans felt the team had "underperformed" at this year's World Cup. I don't know what planet these people are on; England are bottom of Group D, and they are there on merit. England have been the fourth-best team in the group, and the table reflects that. It's time to recognise that England just aren't that good. We have some players who are good, but not great - and plenty who are inexperienced. But what of Costa Rica? How many of their players would you classify as "greats"? How have they achieved qualification with a squad containing no "big name" star players? One thing which was clear from watching Costa Rica is that they had turned up with a plan, and they stuck to their plan. England, all too often, had grand ambitions, but seemed flustered and lacking in composure. The difference between Costa Rica's effective smothering of the threat of Italy's Andrea Pirlo and the way England let him dictate play for large parts of their game against Italy on Saturday was stark. The most marked quality Costa Rica have had is the way they have worked together, as a single unit, to break down opposition teams. England, by contrast, have displayed moments of individual brilliance but have not seemed to gel properly as a team. For many of the players in the England squad, this is their first international tournament. They don't have the experience of having trained together and played together for years. They are still young, they are still learning, and they are still getting to know each other as colleagues and teammates. It is important we don't overreact to England's elimination from the World Cup. England have not been a power in world football for some time now. We can't make excuses. Yes, Diego Godín should've been sent off for Uruguay during the first half of their game with England; a lot of people talk about "foreign players" in the Premier League affecting England (which is utter, utter nonsense, of course - a complete straw man of an argument). These details may distract us from the pain of elimination, and provide pub bores with things to bang on about to anyone who'll listen - but ultimately, we have to face up to the fact that we just weren't good enough. We need to lose the delusions of grandeur, resist the urge to cast desperately around for scapegoats, and stick with this new generation of young players to try and build a squad with the capability maybe to spring a surprise at the Euro Championships in 2016, or at the 2018 World Cup in Russia. Oh, and now that we're out of the World Cup, can we at least no longer show chirpy television adverts "starring" the forced, wooden acting of England football players? I think we should make that a rule, from now on - no more adverts featuring England players once we're knocked out. Blogging? It's just stabbing at a computer keyboard with your fingers! 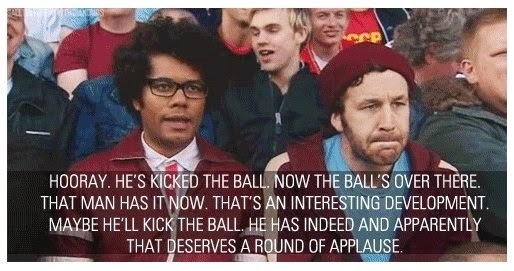 Richard Ayoade as 'Moss' and Chris O'Dowd as 'Roy' in 'The IT Crowd'. The image and quotation above are taken from cult comedy series The IT Crowd. I am a big fan of the show, and of this episode - but the way this picture is being spread around the internet at the moment irritates me no end. Of course, in the middle of the World Cup (the biggest footballing event in the world), we might expect the usual detractors of the beautiful game - those who take a certain amount of glee in describing football as "just twenty-two overpaid neanderthals chasing a leather bag of air up and down a field" (or something similar) - to shout louder than ever. And isn't that just intensely annoying? There's nothing wrong with not liking football, of course. Every individual is free to like or dislike whatever he or she wishes - and that's as it should be. There's not even anything wrong with saying you don't like football. Or even saying so over and over again (although that can get a little tedious). What irks me about these particular kinds of people is the way they go beyond a mere disliking of football to an attempt to belittle and dismiss the entire concept of football. I imagine the grand arm-gesture and the sneering tone-of-voice; "football? Oh, it's just a bunch of men running about." It isn't, though, is it? It's quite a bit more than that, as we all well know. The fact is, it's possible to describe anything in such a way that you reduce it to a couple of disparaging sentences of sheer disdain, distilling the most fundamental essence of a particular activity and then expressing it in a way calculated to imply that it requires no skill, training, practise or hard work whatsoever. You're an Olympic gymnast? Oh, that's just a lot of leaping about in tight lycra clothing. You enjoy fine food? Oh, that's just making stuff warm and then putting it in your face. You like fishing? That's just dangling some string in the sea. You're a mathematician? Oh, that's just writing down numbers. You're a Formula 1 driver? Oh, that's just driving 'round and 'round in circles. You've written a bestselling novel? That's just choosing some words over others. You're an opera singer? Oh, that's just making sounds with your throat. You played the lead rôle in a production by the Royal Shakespeare Company? Oh, that's just saying words while wearing a silly ruff. Not liking something doesn't mean you have to show complete and utter contempt for the whole idea. I don't particularly enjoy watching (or playing) darts - but I can still appreciate that it takes a huge amount of skill and precision to be really good at it. Indeed, I'd have thought that much was self-evident. As at every major international tournament (and oftentimes in between, as well), the topic of foreign players playing in English football leagues is being hotly debated by a whole host of people who have spectacularly missed the point. The argument goes that too many of those nasty foreign players are coming over here with their 'skills' and their 'work ethic' and clubs are playing them instead of decent, honest homegrown English players, who are left sitting on the bench, barely getting any game time at all. And, therefore, this hurts the national team when it comes to big tournaments, because our players can't seem to get a game at club level. There may well be something in that. But calling for restrictions or regulations is a nonsense which would ruin football in this country. Of course clubs are going to play their strongest starting XI given the opportunity - what else would you expect them to do?! If the foreign players are better, more naturally gifted, and work harder in training than their English counterparts, isn't it up to those English players to up their game? If you're not good enough to start for your club, then you're not good enough - don't whinge about it, don't go running to mummy and daddy claiming the other kids are being mean to you… Do something about it! To argue for restrictions is no different, in principle, from the Luddite protectionism displayed by London cab drivers in response to a competitor (in the shape of taxi app Uber) appearing on the market. But this is all a smokescreen for the real issue which haunts the England team - the fact that none of England's players are playing in foreign leagues. Far from wringing our hands worrying about foreign players 'coming over here', we should be 'going over there'. Why is that? Well, we hear a lot of talk about how the Premier League is the best league in the world - it clearly isn't (although that's definitely a topic for another post! ), but what it does have is a very distinctive style of play. Almost all the players who have played for England in my lifetime have stayed in England their entire careers - which makes them rather one-dimensional, no matter how good they are. The 'English way of playing' is all they know - and when players with such little experience of different styles of playing come up against other international teams during the World Cup, they often don't know how to handle them. When you look at the best international football teams, their squads are melting pots of a range of various footballing cultures from around the world; they will have players who play club football in the Premier League, in La Liga, in the Bundesliga, in Brazil, in Argentina, in the US - and this gives them a much more rounded experience of football in general. Personally, I would prefer to see more English players signing for clubs abroad (even - and this is crucial - if not necessarily for the top clubs in those foreign leagues), gaining more knowledge of different footballing styles, different climates, different stadia, etc. - and then drawing all these diverse experiences together to mould an exciting and multi-faceted England team which knows its opponents and can anticipate them. But this will never happen, because in England we are cursed with a vastly overinflated opinion of our own football culture, and refuse to see the bigger picture. "I want to find the best hotel for me…"
So says the implausibly smiley (replete with cute dimples and twinkly eyes) woman who stars in the latest television advert for Trivago - a website which allows you to compare various prices for hotel rooms, and book a room straight from the site. Part of the trend of big companies trying to 'humanise' their image in adverts and in their branding in general, Trivago are trying to speak directly to me, personally - and to you, and to everyone. They're trying to tell you that you're special, you're unique, and that they're looking out for you. You're not; and they're not. The "best hotel for me" is simply a nice hotel. I am not such a special and wonderful individual, so set apart from the rest of the herd, that my requirements from a hotel room differ wildly from what the rest of the population would choose. I want a hotel room which is clean, and has a bed and a shower and a television and towels provided and one of those tiny kettles (but no way to fill it, except in the bath). And so do you. And so does everyone. Please, Trivago - stop trying to make me feel like I'm one-of-a-kind. It isn't working. This evening - at the ungodly (to many, but to me perfectly reasonable) time of eleven o'clock - is England's first game of the 2014 FIFA World Cup. For me, conversation about the match has dominated the past few days; discussions about tactics, possible lineups, score predictions - and about viewing arrangements on the night. During rehearsals yesterday with one of the bands I work for, there was a keen debate about which pubs would be the best places to watch the game - there was even talk of watching it in one of the local nightclubs. Honestly? I can't think of anything worse. Yes, most pubs are going to be showing the match on a screen significantly bigger than my TV at home. Is this a good thing? No. At least, not when it will either be so high up on the wall that watching a full ninety minutes causes a permanently cricked neck for days afterwards, or positioned awkwardly behind a pillar, 'round the corner, past a group of exceedingly tall people who arrived early and positioned themselves inconsiderately close. My television is of a perfectly adequate size for viewing officiating disasters and Wayne Rooney's missed chances, thank you very much. At home, I can sit on a comfortable sofa, with a clear view of my quite-big-enough television; I can see everything that's going on, and I can hear all the commentary and analysis (even if I sometimes wish I couldn't). I can have a drink or a snack without having to pay ridiculous amounts for the privilege, after queueing for twenty minutes (thus missing a large portion of the game) only to be told that the establishment's selection of whiskies is "Jack Daniels or Bells, mate." I won't be in the lose-lose situation of having to choose between standing up all evening and enduring the agony of aching feet and having nowhere to put anything, or sitting on either a rickety and uncomfortable barstool with a partially obscured view or a marginally less rickety and uncomfortable chair with a totally obscured view. Like it or not, the internet and social media have become a part of the way many people experience big global events - like a World Cup. Personally, I like it. I would much rather be at home where I know I have access to WiFi and charging sockets than in a pub fretting about intermittent 3G and dwindling phone battery. This is the big one. People like going to the pub to watch the game because of the 'atmosphere' (whatever that means). To me, it means having to share an experience I ought to enjoy with a group of loutish strangers who get steadily more drunk and more rowdy as the night wears on, in a setting where every surface is sticky, the air is hot and humid with the fetid sweat of many men, and there is a lengthy queue for basic amenities like food, drinks and toilets. Just because I enjoy football, it does not necessarily follow that I enjoy the company of hoards of lager-swilling "white van man" types in England shirts which stretch unedifyingly over their burgeoning beer guts, each convinced he is the biggest football expert in the room and determined to shout down anyone who thinks otherwise. Nor that I enjoy having to jostle for position just to see the lower left-hand corner of a TV screen which really needs the colour contrast adjusting; nor having beer spilt on my shoes; nor paying £3 for a packet of crisps; nor "banter". No, I'm definitely going to stay at home to watch England - where I can actually relax and enjoy the game. 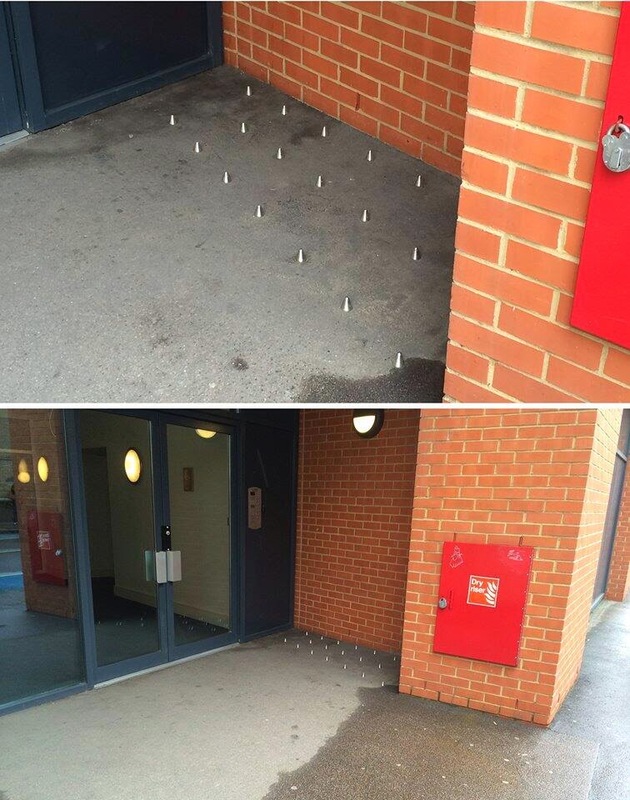 This is an image which has been 'doing the rounds' on Twitter in the past couple of days, claiming to show 'anti-homeless spikes' - metal studs in the ground, designed to prevent homeless people from sleeping in that particular place. Of course, this has sparked a fresh Twitter outrage (these days, a story is scarcely considered 'newsworthy' unless it has sparked a Twitter outrage), and every Tweet I have seen on the issue has condemned the spikes as "cruel" and "heartless". Cruel and heartless it maybe, but if this is on private land is it not the landowner's prerogative to install whatever security measures he or she sees fit? The image above is stark, and paints a picture of intolerant attitudes to those less well-off. It is because this imagery is so powerful that people have been moved to express their anger about this. But in principle, is this any different from putting a fence around your garden, or bollards at the entrance to your drive? I don't for a moment wish to defend the idea of trying to making life even more uncomfortable for those members of society who already have things hard enough. However, if private landowners feel these rather extreme steps are necessary, they have the right to do whatever they choose on their own property. If you find this idea particularly repellent, vote with your feet and refuse to patronise businesses whose premises sport such anti-homeless measures. Television presenter Kirstie Allsopp has caused controversy this week by claiming that girls and young women should turn their backs on going to university and building careers in favour of finding a boyfriend and having children “by the age of twenty-seven”, in an interview with The Telegraph. Naturally, the internet, and the world as a whole, are up-in-arms about these comments. The idea that “a woman’s place is in the home” is outmoded - and disgracefully patronisingly. But it is not a crime not to go to university - and it is not a crime to want to have children, even at a relatively young age; there is no ‘blueprint’ for life, and no path down which everyone must go - higher education may be the right choice for many people, but surely can never suit everyone. Whenever someone in the public eye dares to utter anything which is not absolute orthodoxy, they are denounced as a heretic - as such, Ms. Allsopp is being held up as a symbol of misogynistic oppression. However, she is entitled to her views - and the choices she is encouraging girls to make about their lives, whilst certainly not for everyone, are as much a valid lifestyle choice as any other. What is wrong with a woman making a life as a stay-at-home mother - not because it is ‘her place’, but because it is her choice? It is one of the greatest things about a free society that we are each able to choose - and to promote - the lifestyle choices which we feel best suit us. We are not shoehorned into living a certain way, because that is ‘the way it is done’; this applies as much to pushing people towards university and high-powered careers as it does to encouraging them to stay at home and raise a family. Surely the central message to girls of the gender equality movement is that they can be whoever they want to be - that they can make these choices for themselves, and that they don’t have to follow anyone’s dictate as to what sort of life they should lead? Ms. Allsopp's advice certainly won't suit everyone - and, of course, people are free to heed or ignore advice from anyone, as they see fit - but to castigate her for daring to express this opinion seems (as Lara Prendergast writes in The Spectator) actually to countermand the gender equality movement.